We've seen the iPhone 8 design “confirmed” over and over again in recent weeks, but thus far all the information has been coming from outside sources. Well, what we have on our hands now is different, as it may very well be the biggest iPhone 8 leak thus far... and it's coming straight from Apple itself! After Apple accidentally seeded an early version of the firmware for its upcoming HomePod smart speaker the other day, developers have been hard at work digging through the code in search for interesting tidbits and clues for upcoming products and services. And lo and behold, two of them have stumbled upon some very intriguing references in the code. The image is referencing a device codenamed “D22”. Is this the real codename for the iPhone 8 or is Apple just bamboozling us? It's hard to tell, although it doesn't seem likely that the company would go to such lengths (leaking an early firmware for an upcoming product, leaving fake clues in the code, etc.) to just troll its devoted fanbase. The other find comes from developer Steve Troughton-Smith, who stumbled upon a line of code in the leaked HomePod firmware supposedly referencing Apple's new facial recognition software. As you may already know, a growing number of leaks suggest that the iPhone 8 may not feature a fingerprint scanner and may rely on other types of biometric data—i.e. your face and/or eyes—as a means to authenticate its owner. But even if it does feature a fingerprint scanner, the iPhone 8 will most likely also employ other means for biometric authentication on the side. What Troughton-Smith found was a number of lines in the HomePod firmware that reference “BKFaceDetect” (where “BK” is speculated to be an abbreviation of “Biometric Kit”) and “Pearl ID”, which is supposedly a reference to Apple's new facial recognition tech. Whether that's just another codename or the final name of the feature remains unknown. It is speculated that the face ID feature will rely on an IR sensor and an IR camera situated on the top "bezel" of the device that will allow the phone to detect faces even in complete darkness. 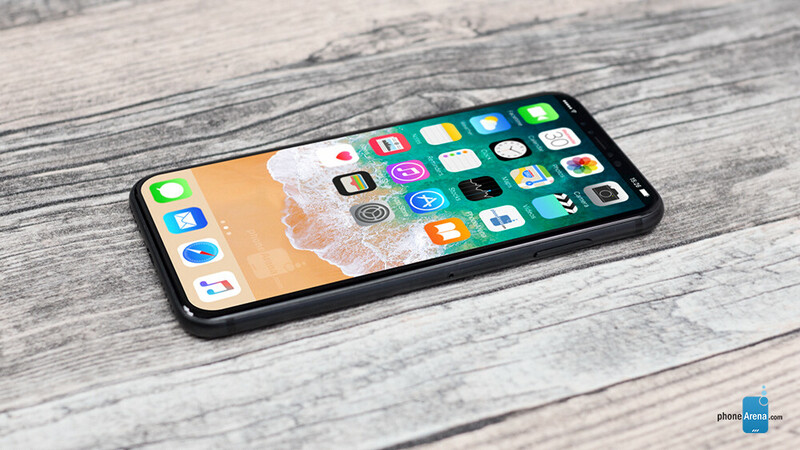 The iPhone 8 could start shipping in October/November, but supply may be limited for months; ‘Face ID’ to replace Touch ID? Jul 27, 2017, 9:07 AM, by Simon K.
2016 - 3.5 mm 2017 - Fingerprint Scanner 2018 - Screen 2019 - Ram 2020 - CPU 2020's Alan F & Ray S "Still the best phone!" Whoa, take the Apple hate down a couple of notches, too much of it can be unhealthy for you. Hate is a strong word. Where's this 'hate' you're talking about? You think this is not hate? One thing was removed in favor of pushing towards wireless, you are making out of it a big deal. Was headphone jack that important to you? You are most likely Android user, so keep using your Android with headphone jack. But no need to exaggerate Apple’s moves. I like the change, you don’t. Push for wireless? When they sell wireless headphones and the adapters for wired ones. They did it for sales bruh open your eyes . "You think this is not hate?" No, I don't but you definitely did. Why? Hope it wasn't me that triggered you. "One thing was removed in favor of pushing towards wireless, you are making out of it a big deal." This is a move that is only to make money. There's no reason people should have to keep buying additional accessories for basic phone functionality. That's anti-consumer. Let's also not forget that Apple is also trying to destandardize the headphone market with this move, as well. You won't be seeing non Apple products replacing the 3.5mm jack with lightning ports, they're more likely to go with more popular replacement options. You're also not likely to see things like airlines adopting bluetooth for their in flight audio connections. Apple is the one who first started pushing lossless audio, so it's kind of ironic that now they're trying to push people towards an extremely lossy solution to listening to lossless audio. It's not surprising but still ironic. "You are most likely Android user, so keep using your Android with headphone jack." Thanks, I will. I'm glad I don't need to charge just to listen to music and I'll also go wireless whenever I feel like it just because I can. "But no need to exaggerate Apple’s moves. I like the change, you don’t." Then you must really like the lightning port and dongles. If they're selling, keep buying!! Not loving =/= hating. Fanatics, whether it be apple or chevy or any other brand, seem to be absolutely positively stuck in the "youre either with us or against us" mentality, for some reason. One cant make a joke or you guys lose your tops. And until there is a wireless solution that can match the headphone jacks audio quality(hint:there isn't), yes the jack will continue to be important to people that actually care about quality. Apples proprietary port cant even match usb-c. I care about audio quality, you dont. Removing the headphone jack isn't pushing towards wireless, because wireless headphone shave been available for years. if they were pushing, then why provide an adapter for the wired ones? Seems like a contradiction to me. Apple removed the jack, because they can't make money off standard parts. This guy here -https://www.youtube.com/watch?v=eURM-j2daRw is a total Apple fan and even he saw the writing on the wall as to why Apple removed the jack. Why can't you? Because you don't want too. You simply like a good little sheep, just repeat what Apple claimed which was nothign m,ore than a lie. People who want wireless headphones, already buy them, whether their phone has a 3.5MM jack or not. The iPhone 7 is the first phone I have ever owned that didn't have a headphone jack, as far as a smartphone. Yet I have used wireless headsets and headphones since the 90's. Yous and Apple's claim is nothign more than a lie. Even though we all know that eventual;y the headphoine jack is gonna die down (not die off), but until they fine a way to give the exact same quality over wireless as you get coreded, its not gonna die off. Even cassettes and records and even VCR tapes are still being used, because the compact disc and its family of discs, just can't give the exact quality of some of the old media. Example, compact disc music sounds like garbage compared to vinyl recorded. Anyone who would claim MP3's are better than vinyl is not a music buff. Even though I personally don't like the sound quality of wireless headphones, I buy them out of convenience. I get tired of tangled cords, or cords getting in my way when riding or doing work. But when I'm chillin, corded headphones are the best and the sound is simply unmatched by ANY wireless headphones no matter what brand or how much they cost. If Apple want to push to wireless headphone, then why make ones as crappy as their wired ones? They bought Beats. Why not place a Beat DSP inside the phone and a DSP inside the headphone and a nice DAC to improve the quality. That's how you push people to better stuff. Apple took the cord, only to make you plug into another hole with a cord. DERP! the sheeps are the ones who decided to make a whiny child like you. go talk like this to your parents, not to me. they seem more sheep to me since looking at how they raised you. you all are the triggered ones that go on every article and cry like a baby about apple being bad. why don’t you go to another website if you think they are biased towards Apple? why don’t you stop commenting? because you can’t you need to cry with your s**tty android. You feel better when you convince yourself into thinking Android is better than iOS. i don’t care about both, but i can definitely tell you that Android has got the most immature users like yourself. Can’t afford Apple? or what’s the problem? why do you follow every article and whine? all you know is being a keyboard warrior. I don't think anyone "think Andeoid is better than iOS. The facts say do. Anything thst is more open is better than something more controlled. Windows is very controlled, but far more open than OSX. Because of that it's 90% of the world adoption and usage. None are perfect. But everything good about iOS is bad one Andeoid and everything great about Android is bad on IOS. Not everyone wants to be controlled like a robot. Some of us just want what we need. The problem is yo7 think something is s**tty simply because you dont like it. You are entitled to your opinion. The problems with people like you, you can't enjoy WTF yo7 like with dedicating on what others like. You are worse than fans where 2 teams play in th3 same city. They always have to be negative towards the other side for no reason.. It's ok to like what you like. You dont have to talk s**t about what others like simply because you dont. Anyone who does that is a notified iduit. I talk bad about both Android an iOS. But IOS has much more bad thingd to highlight in general vs Android. Read my first comment again. Do you see me saying anything bad towards Android or Windows? i tried to keep my comment as polite as possible to not start a war, and to not get called “sheep” or get girly acts like from Supah. i have used both, my first touchscreen smartphone was Galaxy S2 the upgraded to Note 2. and i like technology. But the problem is with the community, i am just saying that why do you people have to comment negatively everytime? it’s all the same people. Do you see me commenting on Android articles crying like a baby why Samsung or Motorola or Lenovo or HTC priced it’s phones high, or why everyone else got into this business trying to be wannabe iPhones and iPhone killers. Yes it did kill iPhone because majority of people prefer downloading free mp3 songs on Android, getting paid apps for free, getting an Android phone for $100-$200, getting a special pleasure knowing that their phone has 6GB RAM, 8 core processor, (notice that microsd and removeable battery topics are going down slowly), and meanwhile, while i do the same thing on my 1GB RAM 16GB iPhone 6 Plus, it was good in it’s time, but now as i take more pictures and apps get more heavy, 16GB memory and 1GB RAM is not enough, if the current iPhones wouldn’t have more than 1GB ram i wouldn’t consider buying it now in 2017. You are mistaking me with other fanboys, just because my nickname includes “i” in it does not mean i am one of those. I have considered buying an Android several times but for some reasons i haven’t yet. Windows is dominating because of price and availability. When we bought our first PC it was because of the price and it was available. unlike Apple products, which always has been expensive and not so popular out of first world countries. I don’t use dongles, even if i wouldn’t have headphone jack, i still wouldn’t need dongle. I prefer paying for AirPods and getting rid of wires. But i didn’t buy it either. I was flashing custom roms on my Android everyday several times, customizing it, overclocking, doing anything possible. But i am tired of it, it is good for time killing, but i don’t need it now. Who does, they buy it, but i don’t. iPhone gets all my work done. As i also prefer Mac too, so i prefer being on one ecosystem. After getting defective Nexus 7 and not seeing a care from Google, i think nobody would like it. It’s all the little things that put someone on using specific ecosystem. So.... you got triggered by a negative comment about a questionable decision apple made, but youre not an "isheep"... got it. You must be kiko7's other account. "IM NOT A FANBOY IM JUST TIRED OF ANDROID USERS NEGATIVE COMMENTS TOWARDS IPHONES!" Triggered? At least i am triggered just for now, but you guys are always triggered commenting crying screaming laughing on every article like a girl in a cringy way. It’s always the SHEEPdroids that start a war and defend the Android like it’s the Android that gave a birth to them. I’m reading news here for 5 years and reading comments when i have spare time, now decided to learn what is your problem, why don’t you calm down? I don’t know who kiko miko is. that must be one of your friends. I don’t click on articles and write “2016 Note 7 blowing up 2017 Note 8 nuclear weapon 2018 Note 9 world war 3 2019 Note 10 universe disappearing” Do you see how unoriginal and childish and whiny it looks? It does, but when the topic is Apple, it’s funny, mature and original. And somehow manages to get as many upvotes as possible. If we would have the downwote system on PhoneArena like back then, i would get minimum 50 downvotes and 3 upvotes for that comment. I wonder why? could it be because the majority of smartphone users are on Android especially on this website? again why? maybe it is available everywhere and for any price you desire? people from a lot of countries are poor, nobody wants to subcribe to music streaming service for $10, instead download for free, or pay for a game that is $5-10, but sideload it, and Apple doesn’t give them that option out of the box. Android does. could that be the reason? some are attracted to specs, some are divorced with apple, some can’t live without changing the ringtone to the country music they desire, people may choose Android for different reasons. But people like this stranger “Supah”, calling people on the internet iTrolls or some other words, got nothing better to do in their life except for coming and arguing here, and not even like a man, like a little girl. The hate is inside him. Even though he denies it, he is hater. Not hating person would not whine. everywhere. That’s it. Some people earn $50 a month, some get $5000, there’s no need to argue who should buy what. Buy what you like and what you can afford, obviously. Well, I'm not specifically talking about your post that I replied to you. But about your other posts here, many of them are anti-Apple. Because you choose to see it that way. In his mind. He's just trying to start a flame war. Ignore him or people who play both sides. Anything negative said about APple is hate. But they say the same thinsg about Android and when you call them out saying they are haters, they claim they aren't. They are such hypocrites. Just ignore them. You are 100% right! What future technology did they replace the jack with? None. It's the same, just a different connector. But th3 fanboys aren't gonna admit to it. MOTO didnt replace it with anything either. Someone should tell Apple & Mr Rambo that bezel-less means no bezels. No it does not. There is Bezel-less and Bezel Less. One means NO BEZELS ans the other means LESS BEZELS. It would be best if you understood the different Its the same as being lean vs having less fat.Meat that is 99% lean means there is a;most no fat, but that isn't equal to no fat at all. Right? If one food as 1lb of fat and you eat something with 1/2 lb of fat, then it has less fat. But its not without fat. I just don't like the indentation at the top. The render looks nice, but that is an eye sore for me. We'll see soon I expect a nice looking actual device from Apple. Stupid question but if they remove the home button how do you return to the home screen on iOS? Virtual button. Sort of like Android... Oh wait!